The RS600 is a highly refined single-hander, a property that owes much to the development team. International Moth designer Clive Everest generated the hull lines, while Nick Peters of LDC provided the conceptual input. The multiple World Contender Champion, Graham Scott, tested the prototype, and top yacht and dinghy builder Dave Ovington helped with the structure. The madforsailing test pilot was Chris Burrough, another ace Contender sailor, on a day that started sunny and moderate - 15 knots with flat seas. Unexpectedly, the wind built through the morning until it was fresh to frightening - a steady 30 knots, gusting 35 with a steep chop. This boat was getting a serious test, and so was Chris. A 'big one' was inevitable, but it turned out to be the big one - a monumental nose dive at speed that resulted in serious air time for both boat and helm. When he'd got her back upright and rearranged his underwear, Chris headed in to take advantage of a feature central to the concept of the RS600 and many other modern dinghies. The boat has a simple performance equalisation system that adjusts sailing weight and righting moment in two ways. There are wide but heavy wings for lightweights under 70 kg and lighter, narrower wings for the helms above 76 kg - if you're in the middle you can choose. The boat also has a removable lower mast section, creating a smaller rig on which the sail foot can be rolled and the excess zipped up. It was this facility that Chris used after his spectacular capsize, and the boat became substantially more manageable. Praise and high scores go to a number of features. The weight equalisation system seems to work, with no preferred crew weight dominating race results. And as we found, the rig size reduction - not just in strong winds but also while learning to sail the boat - is a real benefit. The fantastic acceleration down some enormous waves didn't overshadow the stunning speeds that the boat was also capable of achieving upwind. Credit is due to the elegant carbon composite mast, which was still standing after Chris's big capsize. The rig provides excellent gust response and the Hyde sail is well developed for controllability across the wind range. There were very few features on our test boat that did get the thumbs down. The sail feeder was probably the worst - it didn't control the mainsail hoist at all. But this is a detail, and despite the extreme conditions of the test and intimidating as it may look, the good news is that the RS600 is not just for super-heroes. 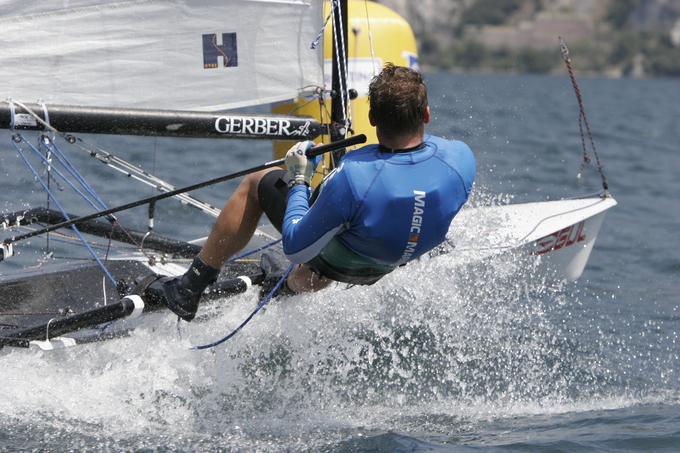 Sailors will need to be reasonably competent, agile and - in the early stages at least - being a good swimmer with some previous trapeze experience won't hurt. But in terms of single-handed mono-hull sailing, I suspect the only boat that has the potential to equal her performance is the Musto Skiff. The RS600 also has a well-organised calendar, which was sponsored by Gul in 2000. There are events most weekends throughout the summer, and up to 50 boats regularly turn out. Currently there are over 350 on the water. ​There's no doubt that you can get all the thrills required to frighten yourself stupid by taking the RS600 for a sail in 30 knots. But it's also nice to know that, even if it is a little tricky to sail, this boat is fast, cleverly thought-out and well developed. The interior layout is simple, and it puts the few necessary controls close at hand without any undue complexity or clutter, with the fittings coming mainly from Holt Allen. But although the cleats for all three control lines are located on the gunwale, with the lines led out to the end of the wings, adjustment at speed can prove somewhat fraught. The move forward and inboard for a swift pull or ease required a bit of forward planning. There were times when the optional foot loops would have made life easier downwind. But the biggest feature in that respect was unquestionably the ability to reduce sail. The benefit is a well-canvassed boat - the full size mainsail is pretty big at over 12 square metres - that can still be managed in seriously breezy conditions. As is very much the fashion with the latest generation of boats, the RS600 has a facility to adjust the weight and righting moment to suit the helmsman. Just two options are available with wide but heavy wings for lightweights and lighter narrower wings for the larger helmsmen. Those tipping the scales below 70 kg get 100 mm wider wings and 6 kg of corrector weights. While those above 76 kg get the narrow wings and no lead - those in between are free to choose either set-up. It might lack the subtlety of some other systems, but the simple approach does seem to work quite well, with no size or shape of helmsman yet tending to dominate the racing results. More importantly, the RS600 is blessed with a system that offers significantly greater benefits than a simple change in sail area and righting moment. By removing the whole lower section of the mast and rolling the bottom of the sail, both the aerodynamic drag and the height of the centre of effort and gravity of the rig are much reduced. Aside from keeping the balance between driving force and drag, the reduction of the centre of effort and gravity makes the boat much more manageable, especially when capsized. Clearly the reduced rig will prove attractive to those starting out in the boat. And for the more experienced, it has introduced a substantial tactical dimension to the racing. Current class practice suggests changing to the smaller rig between 16 and 18 knots of breeze - with improved performance upwind, and better manageability more than compensating for loss of pace downwind. But back-to-back racing in a building breeze will certainly test the grey matter. ​The one poor detail on our test boat was the sail feeder, which seemed incapable of keeping the sail under control even with two people hoisting. ​The price tag is not insignificant for a boat that you're going to sail on your own. But on the pounds-per-performance scale it's got to be good value. And with a well-established racing scene the resale value should hold up. Step one is always getting off the beach, and this provided us with no real problems because we thought through the sequence of events in advance. The pivoting rudder helped a lot, although control is at best marginal until it's fully down. Similarly, the centreboard is small and light enough to be managed with just one hand and even in the three-quarters down position it provided enough sideways resistance to allow a reasonably dignified escape from a lee shore. With confidence and perhaps a bit of practice, departure becomes more akin to a short-board water-start than a conventional dinghy launch. Climbing aboard, sheeting in and bearing away can be accomplished as one seamless movement. Unlike a short-board, there's no need to go flat out straight away, the RS600 is quite manageable with the helmsman out at the end of the wing rather than fully extended on the wire. It's perfectly possible to get upwind, albeit slowly, with the helmsman simply sitting out. More importantly, tacking can be accomplished at quite low speeds. Getting under the boom presents no problems and the novice's initial crawling-based attempts should soon progress into a more advanced run and duck. But for those who haven't sailed with a fully-battened rig before, tacking can present some difficulties, even if your wire-to-wire performance as a helmsman is slick. If you're unused to a long row of seemingly near rigid battens, the sail's ability to produce lift in one direction or another even when the sheet is slack can produce a nasty surprise. The secret seems to be to go into the tack as fast as possible, and then take your time to get sorted out once round. If you give the sail a sharp tug as it comes across, that will help prevent the battens from reversing in lighter conditions. We began by beating into 15 knots with relatively flat water and even the 25 knot breeze and rather steeper seas were still no problem. Both the vang and, more particularly, the cunningham tension were critical to controlling the power available from the rig. By the end the rig was well beyond its designed wind range and substantial amounts of cunningham tension proved essential. It was at this point that more power in the purchase system would certainly have been beneficial. As might be expected the carbon rig provided excellent gust response and little more than a small luff and minor mainsheet adjustments were required. Big gusts see the light boat accelerating freely upwind with no tendency to stagger, though the sharper seas did necessitate a very positive steering and sheeting technique to get over or around the oncoming waves. And get around the waves you must; spearing into them in such a light boat simply stopped it dead. Close reaching proved relatively easy and once mastered, there was a technique for going deep downwind sitting on the end of the wing. Control at speed is facilitated by a large rudder which, though well loaded, always got the boat to do what we wanted. If there are going to be problems, it's when trying to sail on a broad reach without actually running off. The secret, it seems, is to bear off massively in the gusts. Otherwise the large roach tends to pitch the bow down in a gust and the relatively narrow fore sections, with only minimal reserves of buoyancy, simply go through the back of the wave in front (as Chris demonstrated). By the time it was blowing 30 knots the boat was a handful, no question and probably no surprise. But after Chris' spectacular effort we put ashore and removed the lower mast section, resuming the test under reduced rig. Despite a further increase in the wind, the boat proved substantially more manageable, though it must be said, still far from a walk in the park. But let's face it, if that's what you're after, buy a dog. In case this all sounds a bit intimidating, it should be pointed out that the conditions were extreme and one or two of the test team reckoned they might have been having equal trouble in a Laser - at half the speed. ​But for those coming from non-trapeze boats a short spell on the wire up front in a two-man boat might prove helpful, while those moving aft from the crew's position might do well to try their hand at the back in something a little more manageable. That said, the RS 600 should not prove beyond the grasp of any competent dinghy sailor, nor indeed any reasonably skilled windsurfer. The rewards to be had from mastering a boat with such exhilarating performance are exceptional. The downwind acceleration in the waves of Southampton Water was both breathtaking and sphincter-puckering. 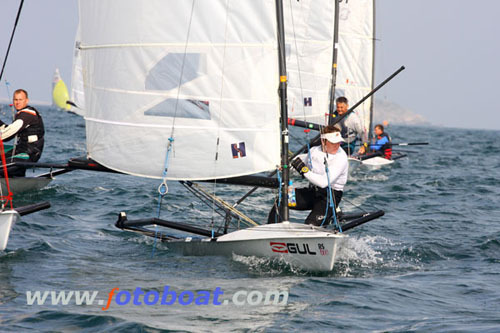 But the stunning speeds upwind and down, even in quite light air, are balanced by relatively easy handling. In terms of singlehanded monohull sailing, the RS600 probably has few, if any, equals for performance. 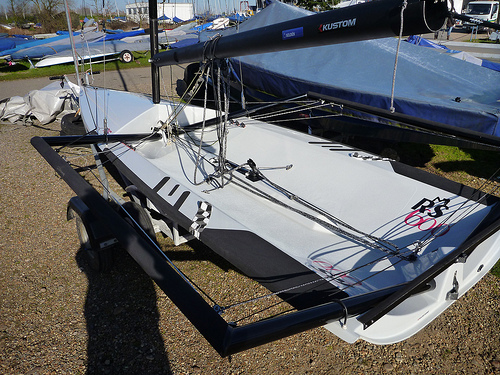 And if you think of the RS600 as a singlehanded skiff, both in terms of performance and fun, you won't be far wrong. Built from state-of-the-art epoxy glass composites over a foam core, the hull is at once both light and durable - you can't ask for much more than that. The mast is sweet too: Clive Everest designed the elegant carbon rig, which was built by Roger Angell from a pultruded tube with an integral track. It's one of the nicest composite masts I've seen. Chris' little mishap also turned out to be ample demonstration of the build quality of the mast. After he had righted the boat, we discovered the sleeve joining the two mast sections was slightly bent, though the mast was very definitely still standing. On reflection we reckoned that far from condemning the rig, this small failure was indeed a recommendation for the strength of the basic carbon structure. The fact that a capsize that would undoubtedly have destroyed most aluminium masts resulted in only minor damage to a ?20 aluminium sleeve providing proof, if any were needed, of the maturity of carbon fibre as a mainstream mast material. The team from Hyde sails has also proved crucial to the development of the rig, producing a sail that is not only unusual in concept, but one which looks good and offers excellent controllability right across the wind range. The usual rock solid performance from RS, we wouldn't expect many problems, unless of course you choose to flip the boat repeatedly on its nose and hurl it into the water like Chris did .... And even then it doesn't seem to cost you more than 20 quid a pop. ​The boat benefits from the great circuit set up for the RS range, and as a racing boat - in the UK at least - the RS600 has quickly established itself. There's an event almost every weekend in the summer, and LDC tell us that up to 50 boats are regularly turning out at open meetings.